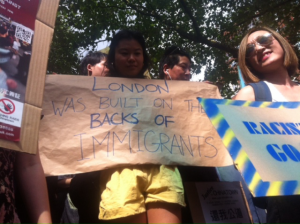 Mei Mac, activist and actor pictured at Chinatown demo against immigration raids (August 2018). What we do is largely determined by the needs of our network partners. Our current approach is influenced by a recent survey that we did where a number of community organisations gave their perspective on what role we should be playing in the capital. The London Project works to uphold and strengthen the rights of all migrants, regardless of status, in London. Working in partnership to campaign and advocate for the rights of migrants. Producing and working in partnership to support the production of Know Your Rights guides so that migrants and the people advocating for them understand and know how to assert their rights. Reflecting the views of migrant organisations at the Greater London Authority (GLA). We also respond to changes in the socio-political and economic environment. If you have an idea for collaboration, please get in touch. This work is generously supported by Trust for London.